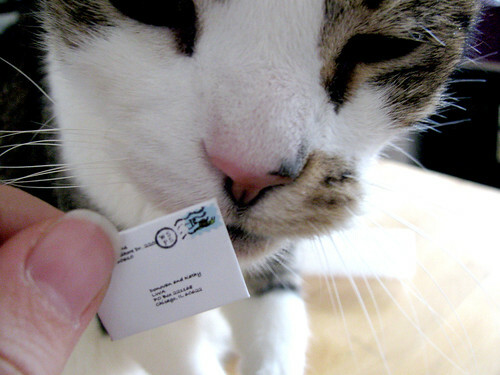 Behold Sebastian, essential member of the Feline Postal Brigade, with a teensy tiny letter. Photo by intrepid postal goddess, Donovan. Are you on Flickr? You, too, can add photos of postal kitties to the Feline Postal Brigade group - please do! The world needs more postal kitties. We must have been mentally insync today because I wrote a post today (to publish tomorrow) about the newest member of my home mailing staff and of course threw in a link to the feline postal brigade! Cats and mail - all your missing is tea and a blanket! Cool, thanks for the link - and congrats on your lovely new home! Aww I had to post to say how cute! Thanks for sharing. 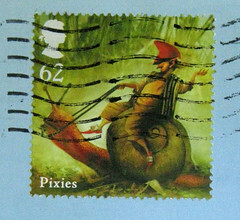 I would love to get a teeny letter like that in the post too!